Gambia and South Africa have been engaged in a kind of World Cup of Health Leadership Madness over the last few years, particularly in regard to HIV/AIDS. Think of the similarities: Thabo Mbeki, South Africa's president, has long been swayed by rogue scientists who deny that HIV causes AIDS, and has made it plain that he believes antiretroviral drugs are simply toxic, their consumption benefiting pharmaceutical companies rather than patients. Yahya Jammeh, president of the Gambia, is equally skeptical about Western medical approaches to the virus, but his style is more pragmatic. He does not enter into etiological niceties or dark conspiracy theories, he simply rolls up his (rather elaborate) sleeves and provides a cure for AIDS (and asthma, hypertension, infertility) with special homebrewed remedies. More similarities: both leaders have Ministers of Health who are basically lackeys, abusing their positions of medical authority by legitimizing the wonky views of their superiors. South Africa has its Manto Tshabalala-Msimang, infamous for touting the benefits of beetroot and garlic for AIDS patients while harping endlessly on the negative side-effects of antiretroviral drugs. Gambia has its Tamsir Mbowe, who is willing to drop whatever scientific scruples he ever had and endorse his president's magical curative powers. Or he was, until yesterday: Dr. Mbowe has been fired. Rumor has it that he was heard muttering that President Jammeh can't really cure AIDS after all. Or maybe it is the scandal Dr. Mbowe is embroiled in about his involvement in the sale of rice, deemed unfit for human consumption, to the poverty striken Gambian people. President Jammeh did not say that he cures AIDs, all what he said was that he treats AIDS and gets rid of the virus from the patients' bodies. He said all medicines have side-effects, but his traditional medicines have no side-effects, noting that all its side-effects are positive. 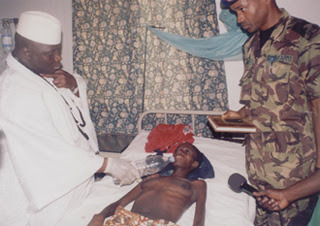 The proof of the effectiveness of President Jammeh's treatment is that although it was claimed by some critics that the patients who were under ARV [anti-retroviral treatment] will die if they stop taking such medications, these have proven critics wrong when President Jammeh asked those patients on ARV to stop taking them. In regard to HIV/AIDS policy, South Africa clearly has a wayward President and Minister of Health. But they stop short of advising patients to go off AIDS treatment, and at least South Africa still has a flourishing journalistic tradition of dissent and criticism. The health of Gambia seems to be seriously compromised in more than just the area of HIV/AIDS.